THE MASONIC ROLE IN AMERICAN HISTORY « THE BRYCE IS RIGHT! – How Masonry affected America. I have been a Freemason for many years and I am still surprised by those people who believe the Masons have a secret agenda in terms of manipulating the country or stockpiling incredible amounts of wealth. Heck, we have trouble organizing a picnic. However, there is reasonable evidence to show Masons were involved with the founding of the country. For example, of the 56 men who signed the Declaration of Independence, 9 were Masons (16%), and of the 39 men who signed the U.S. Constitution 13 were Masons (33%). Of the 44 presidents we have had, 14 were Masons (32%) with the last one being Gerald Ford. Beyond this, few people outside of the fraternity truly understand the impact of Masonry in America. I participate in a book club whereby we have been studying the history of the United States, from the Revolutionary War to today where we are studying the Reconstruction period following the Civil War. Throughout these books, there is mention of the various founding fathers who were Masons. Inevitably, I am asked about their Masonic heritage. For example, in the book, “Benjamin Franklin: An American Life,” by Walter Isaacson, the author mentions Franklin’s Masonic background, but it was obvious to me he didn’t comprehend the fraternity’s influence on Franklin. Our acclaimed inventor, author, printer, ambassador, and postmaster was raised a Master Mason at St. John’s Lodge of Philadelphia in 1731, and become the Provincial Grand Master of Pennsylvania three short years later in 1734. Franklin was considered to be America’s top scientist and intimate with American politics. He is the only founding father to sign the three most important documents of the time: the Declaration of Independence, the U.S. Constitution, and the Treaty of Paris (thereby ending the Revolutionary War). In 1771, Franklin visited Ireland and Scotland. During this time, his hosts were surprised by how well he was received by the people. What they didn’t realize, nor Isaacson, was Franklin was not just a respected scientist, but was also well known in the Masonic community who embraced “the age of enlightenment” which opened many doors for him. In the late 1770’s, Franklin was appointed the first United States Ambassador to France. Again, he was warmly welcomed by “enlightened” Masons. So much so, he joined Loge des Neuf Soeurs in Paris, and became the Master of the Lodge in 1779. His influence was great and, as such, he helped initiate the great French philosopher Voltaire into the fraternity, among others. Freemasonry at this time was very much concerned with discussing philosophical and scientific subjects, and questioned everything. Theoretically, it is still supposed to be this way today but it has turned more into a social club as opposed to discussing “enlightenment.” Nonetheless, Franklin’s Masonic background proved useful in forging relationships with Europe and ending the war. The “Father of our Country,” George Washington, was raised a Master Mason in Fredericksburg Lodge No. 4 A.F.& A.M., VA, in 1752. It is said he had a high regard for the fraternity due to its sense of “enlightenment” and order. However, due to his commitments as General and President, Washington could not afford to spend much time attending Lodge. In 1787 Washington was elected to preside over the Constitutional Convention in Philadelphia which devised the U.S. Constitution and thereby our government. Washington was elected primarily due to his prestige, but his Masonic heritage, with a keen sense or order and protocol, certainly helped. Keep in mind, the discussions and votes were kept secret until the conclusion of the convention which lasted approximately four months (May 25th – Sept 17th). This is a testament to Washington’s ability to run a meeting. There may have been no love lost between Jackson and Clay, yet they respected each other as Masons, which may have ultimately been the reason why Jackson never acted on his regrets. As an aside, Clay was a member of Lexington Lodge No. 1 F.& A.M. in Kentucky and Jackson was raised at Harmony Lodge No. 1 F.& A.M. in Nashville, Tennessee. 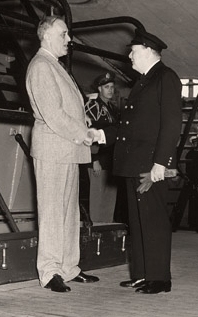 Unlike Clay and Jackson, perhaps the strongest bond between political leaders was between President Franklin D. Roosevelt and Great Britain’s Prime Minister Winston Churchill during World War II. FDR was raised a Master Mason at Holland Lodge No. 8 F.& A.M. in New York in 1911. As a career politician he had limited time for Masonic activities but there is strong evidence he supported the fraternity, such as having his three sons initiated into it and becoming an honorary Grand Master of the Order of DeMolay, a Masonic youth organization. Churchill’s ancestry included many Masons and he became a Master Mason at Studholme Lodge No. 1591 in 1901. Like FDR, his political career kept him from actively participating in Masonic activities, but he maintained his affiliation. As the war began, Great Britain was essentially alone and isolated. The country desperately needed the resources and assistance of the United States. On August 9th, 1941, prior to America entering the war, the two leaders met secretly in Placentia Bay, Newfoundland. Churchill arrived on the HMS Prince of Wales and met Roosevelt aboard the USS Augusta. The two had met during World War I when FDR was the Assistant Secretary of the Navy, and Churchill as Lord of the Admiralty, a loftier position. Churchill had forgotten the meeting, which slightly perturbed Roosevelt, but years later as Prime Minister he desperately needed to know the President. Freemasonry was an important connection as it established the values both men possessed. When meeting FDR aboard the USS Augusta, Churchill gave FDR what appears to be a Masonic handshake thereby denoting their relationship. With such common values, the men were able to speak “on the level,” and form a strong bond which was helpful in forging the Atlantic Charter. I am certainly not suggesting Freemasonry was the principal influence motivating these men of history, but it certainly didn’t hurt. It taught them about building relationships based on common values, protocols, and the search for “enlightenment.” There are many other stories of how Freemasonry helped to shape America, such as my article on, “Montana 3-7-77 – How Freemasonry Tamed a Territory.” However, as I delve into the history books I am appalled by how Freemasonry is shrugged off as an irrelevant aspect of history. It may not have the significance as purported by anti-Masonic conspirators, but it did have an important role to play in forging relationships. I just wish historians would pay closer attention to how Masonry influences the lives of people. NEXT UP: SYSTEM MISCONCEPTIONS – Is an information system the same thing as a program or “app”? LAST TIME: SEEKING THE TRUTH – How Lincoln handled the slavery issue. This entry was posted on January 28, 2015 at 6:00 am	and is filed under History. Tagged: Florida, palm harbor, The Bryce is Right, THE MASONIC ROLE IN AMERICAN HISTORY, tim bryce. You can follow any responses to this entry through the RSS 2.0 feed. You can leave a response, or trackback from your own site. Tim keep up the great information! Truth is hard to find these days! Great article I have never been ashamed of being a Mason. Wish I joined earlier. “Perhaps, just perhaps, one contributing reason to why historians do not attribute more to a Masonic influence in this country is because they are not Masons themselves, and thus do not KNOW much about how it plays a role in interpersonal relationships. “The values of Freemasonry define what it means to be an American. They follow the natural law and the precepts of all religions.